Also, that’s a good example of reported speech, which we’ll be talking about in one of my classes next week. For example, what were John’s mother’s exact words to him? What did he say to the people at school? Notice in this example that we have to change the subject or the object when reporting speech. We also have to eliminate the helping verb “do,” but we need to keep the sentence in the same tense (in this case, the simple past). They told me I didn’t understand the assignment and I told them they didn’t understand life. John’s mother told him that happiness was the key to life. John’s teacher asked him what he wanted to be when he grew up. John told his teacher that he wanted to be happy. John’s teacher told him that he didn’t understand the assignment. 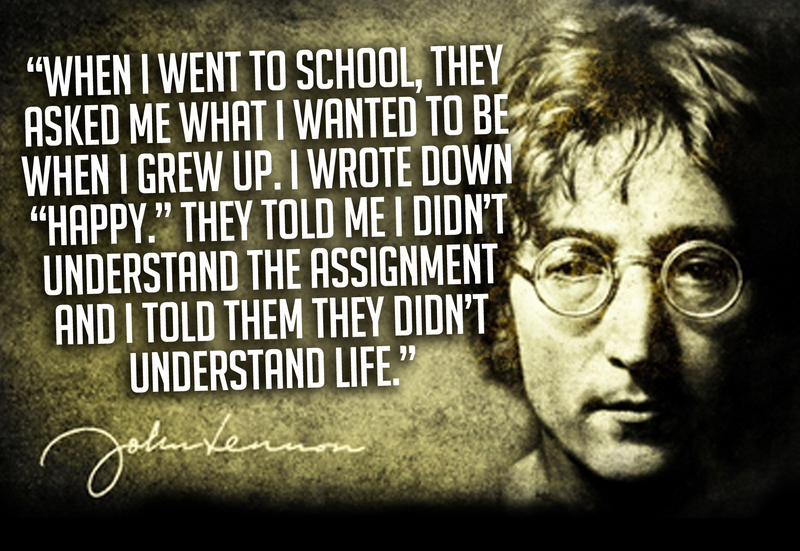 John told his teacher that he/she didn’t understand life. Can you change these direct speech phrases and sentences into reported speech? If so, leave a comment, but they’re pretty difficult! Anyhow, that may be a bit confusing for you, especially if you’re not an intermediate or advanced English learner (that’s when this is usually taught to students). If you’re in my class now, you’ll be working with reported speech very soon, but don’t worry, it’s not too bad!